Custom installations include features such as; video monitoring, voice communication, dog door access, food/water control, and much more. Video monitoring and voice communication is achieved through your phone, so you can rest easy knowing your pet is comfortable and safe. If you see a problem, give us a call and we’ll take care of it. You can monitor and communicate with our staff on your phone to make sure everything is going okay. This is beneficial with older pets or ones that occasionally require medical or other types of support. 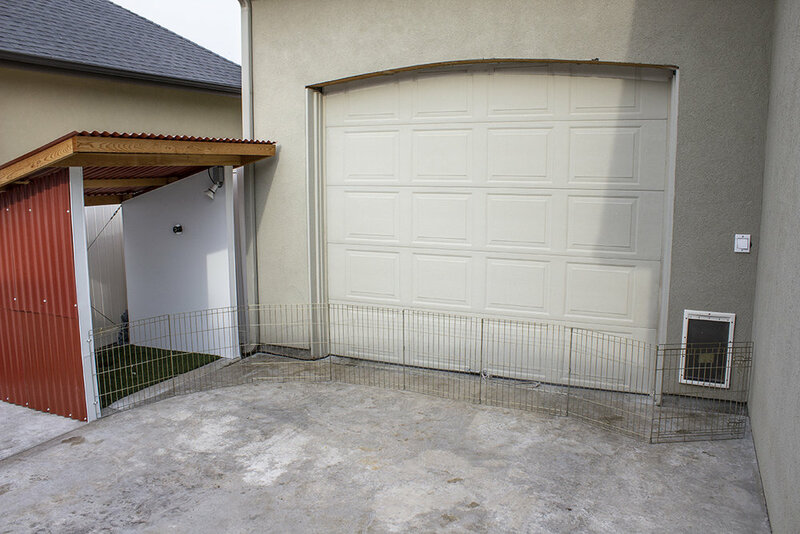 Custom phone-controlled dog doors allow your pet access to the backyard at your discretion. These services are perfect for cold weather, or when you are in need of any home maintenance services. Imagine having the ability to give your pet options of being outside while you are not home or keeping your pet stress free when the lawn/pest control companies visit, the possibilities are endless. You can feed your pet while away and monitor everything from your phone. No pet boarding is required, especially for a short weekend or long day trips. You may leave your pet at home where you know they will be comfortable and stress free. 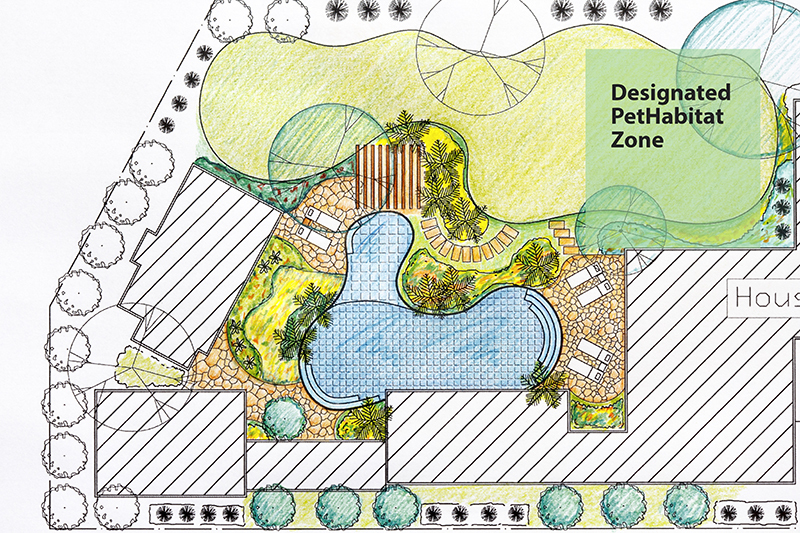 Waste Away system to be set up and have the opportunity to keep a nice/clean yard for your family and friends to enjoy. Custom Pet Habitats give you peace of mind, comfort for your pet, and are environmentally friendly! This is the revolutionary new system for dealing with pet waste. This system keeps the mess out of your house and out of our waterways. The system utilizes our WasteAway unit connected to the sewer piping in your house where it belongs. This is the ultimate solution for your PetHabitat. This system can be installed on your new home or retrofitted on your existing home. This controls outside barking and allows you to monitor feeding and outside privilege from your cell phone. This is the future of pet care. 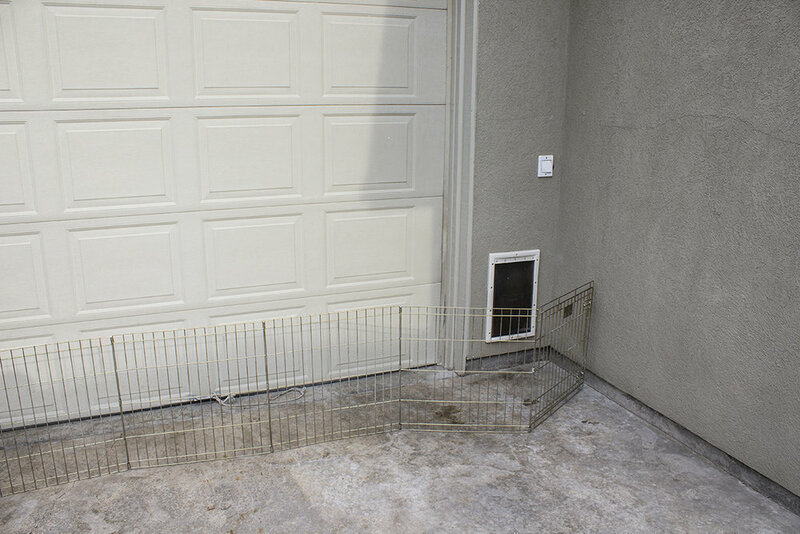 We can design your pets habitats from a simple WasteAway unit at the front door to collect our Flusheze water soluble waste bags from your dog walk to a completely automated system using your cell phone.